Save up to 58%, why not try? Soothe and protect dry eyes with Blink Intensive Tears Bottle, for exceptional and long-lasting eye comfort. These eye drops may even be used whilst wearing contact lenses. Designed by AMO, Blink Intensive Tears are specifically formulated to relieve eye dryness and offer a solution to the problem of excessive tearing. Often whilst working in an office or studying, we find ourselves subject to prolonged screen use and air-conditioned environments, factors which can lead to dry and irritated eyes. These highly effective eye drops provide instant relief and prevent any blurriness of vision. They contain OcuPure and Sodium Hyaluronate, a viscosity enhancer used to mimic natural tears to offer their moisture and rehydrate your eyes for a long-lasting effect. 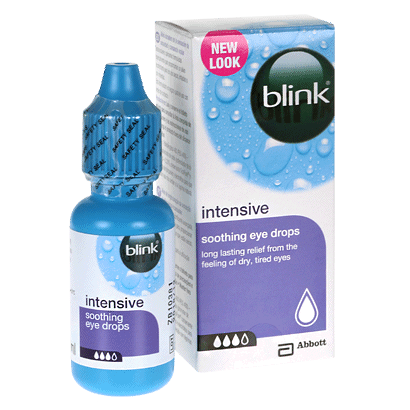 Blink Intensive Tears eye drops are available in a 10ml bottle to carry with you when you’re out and about. For added convenience, they also come in handy preservative-free single-use vials. At FeelGoodContacts.com, we stock an extensive range of eye care products to meet all your eye care needs. Very reliable service. You get what you need - when you need it!! As a dry eye sufferer, these enable me to wear my lenses for much longer. Much better than anything I have bought previously from supermarket. Great for my dry eyes, makes wearing lenses bearable. Not long lasting enough for my severe dry eye condition. Only brought relief for an hour. I ordered three bottles of the Blink Intensive Tears, on line, and I am very impressed with the speed of the ordering process and the delivery service. These drops to me are like gold dust! they actually do what it says on the bottle! they give great relief from dry eyes which cause much pain in the eyes and blurred vision, i highly recommend these eye drops! I have never had to look any where else for relief since i had these recommended to me by my optician, if you suffer with dry eyes i cannot recommend these enough! I think it is a good product. Not really sure what''s difference between this and the one which I bought at boots.